So, as my first action back on the blog, I'm going to do a little catching up on what I've been enjoying this summer. The quickest for me to update you on will be music. For the last five years, I've complained at how lazy I've become with learning about new music. In high school I was obsessed, reading Q, the NME, Rolling Stone, Spin, and various online music publications. I used to stay up until early morning to watch the new, hip music videos on Fuse and MTV2. I'd go to record stores and pick up CDs I'd never heard of based on the employees' recommendations. I don't think a day went by when I was 14, 15, 16, that I didn't listen to some new music. And then I went to college and this practically all stopped. I don't really know what happened. I was busier, yes, but I spent hours and hours screwing around on the internet, just not looking for new music. The wonderful radio station Indie 103.1 came and went, and I just waited for new music to come my way, on mixtapes by friends usually. I've loved Regina ever since hearing "Samson" performed a capella by a friend of mine a couple of years ago. I immediately bought everything of hers I could get my hands on. When I saw her perform live at the Wiltern a year or so ago, it was a really remarkable, ethereal show. This summer, her new album quickly became my favorite. Upon my first listen, I knew that it was immensely more enjoyable to me than "Soviet Kitsch" or "Begin to Hope," both of which I love. "The Calculation," "Eet," "Laughing With," and "One More Time With Feeling" instantly became my favorite tracks, and I had them memorized within days. I even called my boyfriend while I was driving home and made him listen to "Eet" with me. I'm going to be seeing her at the Greek Theatre in October, and I think that the kookiness of this album will be on great display at that venue. The religious tones of her work come back with a passion, and her voice...is as mesmerizing as ever. She & Him, "Volume One"
My enjoyment of "country-fried indie rock" (as I once termed it in an article I wrote for school) came as a surprise to me in high school when the particular stylings of bands like Rilo Kiley and Limbeck were all I wanted to listen to. The lilting twang of Zooey Deschanel's voice fits in perfectly with that, and is left stripped bare with M. Ward's music. I don't like every track on this album, but there's something so desperate in the vocals that I can't seem to get enough. My friends and I even sat through Yes Man to hear Zooey singing. It was not worth it. Here's a video of Elvis Costello, Jenny Lewis, and Zooey Deschanel on stage. It's like fantasy rock band for me! Okay so I don't know too much about them, but thanks to Ash, I got to see them live at Space Land for free, and they were a really wonderful show. I think the last time I saw a really great small act in a small venue was Everybody Else at the Troubadour in 2005 or so, and they are two very different kinds of bands. The Temper Trap was energetic, and played cleanly, and definitely piqued my interest. They have a song, "Sweet Disposition" featured on the (500) Days of Summer soundtrack, so I'm excited to see what happens for them next. A few weeks ago I got a friend's extra ticket to see DCFC perform with the L.A. Philharmonic at the Hollywood Bowl. It was a wonderful last minute surprise, though the performance was less impressive than expected. We got there while The New Pornographers were opening, which was a shame because I would have liked to see more of their set. They were quickly followed by Tegan & Sara, who were very talkative and charming, and played a good mix of older and newer music. Death Cab performed one short set solo, again with a good mix of old/new, and then one set backed by the L.A. Phil. Something was just missing though. The sound was off and consequently some of the horns drowned out the rest of the music, and some of the DCFC songs felt at odds with the horde of instruments and the huge venue. Plus, Ben Gibbard seemed to be phoning it in a bit. The general consensus among my friends seems to be that he's happy now that he's engaged to Zooey Deschanel, and can't really bring the angst to his music anymore. In 2004, DCFC performed at the Wiltern, and when they ended the show on "Transatlanticism," the stage filled with yellow light and fog, it felt like I was floating in the air, alone with the music. When they ended the Bowl show on the same note, there were fireworks in the air, and it became a spectacle. 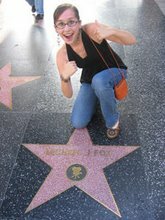 In the end, the best part about going to show was being at the Bowl, picnicking in the Hollywood hills and chatting with friends, as it always is. Back in April, I waited in line at the Dorothy Chandler pavilion while Laker girls, wand'ring minstrels, and various Spam-themed games and activities carried on wildly around me. I was queuing up for discounted tickets to the preview shows of Monty Python's Spamalot, in town starring John O'Hurley. I know that the theatre doesn't quite count as "music," but I figured this was as good a place for it as any. Those of us familiar with the Pythons, and The Holy Grail, probably got more enjoyment out of the show than the unitiated. We knew which jokes to expect, but there was enough of a new take on the material to be freshly entertaining. My mom who has no Monty Python experience laughed wildly the whole time, and couldn't believe how crude some of the humor was, so maybe I'm wrong. There were a few little kinks to be worked out (it was in previews, after all), and the faux program in the Playbill was one of the funniest parts of the show, but overall I enjoyed it quite a bit. That's all I can think of for now. Lately my car's CD player has been playing audiobooks mostly, as it helps more during a long commute than music sometimes does. Thank you! 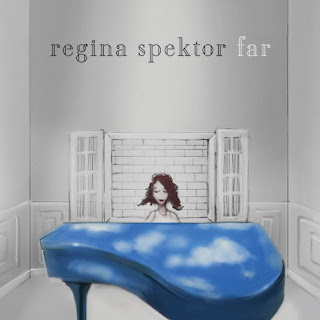 People looked at me like I was crazy when I said that the new Regina Spektor was better than "Soviet" or "Begin." Although you fail to mention the best track, Blue Lips. Wow wah WOO woo!